Designed and developed a 12-story office tower to be the new home of the University of Chicago Medicine faculty. Connecting to the Center for Care and Discovery the office building is placed atop an existing parking garage and trauma center. 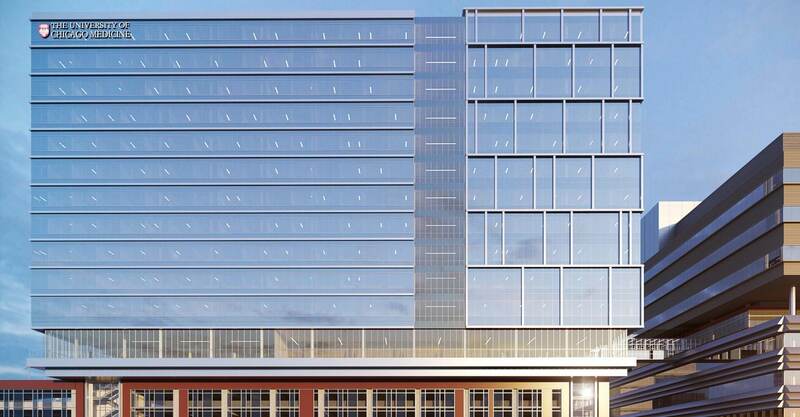 The 265k sf tower utilizes a transfer level of truss beam at the top of the 8-story parking garage to achieve efficient core to curtain wall depths and core dimensions. Circulation into and out of the tower was critical as faculty need direct access to the clinical spaces at the Center for Care and Discovery but also to ground level. Utilizing an existing parking garage stair tower, the project connects directly to the ground via a transfer pavilion.